Were you at the 1959 AMA Nationals? Yes? Had you forgotten about it until you ran across this article? Billed as the first truly "national" meet because there was at least one contestant from each of the states, 1959 National Model Airplane Championships was held at the Naval Air Station, Los Alamitos, California, from July 27th through August 2nd. If you were a kid at the time, take a look at the photo in the center of the article to see if you can find yourself. Your father... grandfather? My purpose for posting these old article is to give modeling pioneers maybe their last opportunity to re-live the good old days of their youth. Send me a note if you find yourself, and I'll note it on the page. "I am Mike Bryan and ran into your site via the internet (8th from the left top row) Tennessee State Champion. I won 1st in scale with the P51 noted in your pics. Also 2nd in scale in 1960. It was a marvelous experience for a 15 year old and certainly gave me much confidence for the rest of my life. I made several friends at this event that I wish we had been able to stay in touch with one another. I am now retired and have been living in Oviedo, Florida, for the past 40 years. I have many of the planes that I competed with (speed, combat, carrier and of course the P-51). And I have been collecting and refurbishing engines for the past 50 years. I was known by the other guys as Johnny Reb at the event. If you hear from anyone else please keep me informed - email is fine. Thanks for the good memories, Mike. " Update: Rick Berrier wrote in to say he saw himself in the group photo at the bottom of the page! "I saw your article on the 1959 Nats in California. I was the Air Youth State Champion form North Carolina. I am in the middle of the second row in the dark shirt. I also won this honor for the next three years, Willow Grove, Lakeview, and Dallas. My name is Rick Berrier and I flew competition until the Nats in Olithe, Kansas Nats in 1968. - Rick Berrier "
Fifty young men, all under twenty-one years of age and each representing a State in the Union, including Hawaii and Alaska, competed in the 1959 National Model Airplane Championships at the Naval Air Station, Los Alamitos, California, July 27th through August 2nd, along with hundreds of other entrants. It was the first time in the 28-year history of the "NATS" that an official representative from each State was in attendance. 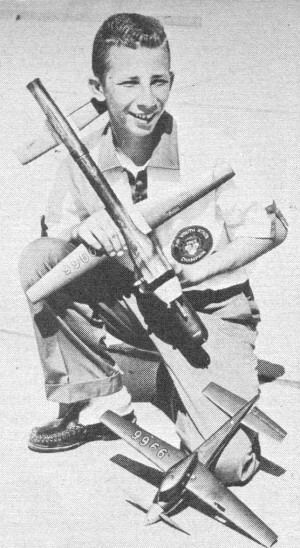 John Bowman, 14, New Orleans, with winning B speed & 2nd place jet entries. Sr. Champ Sherwin Maslowe, Mich. AYSC'er. Mike Bryan's C/L scale winner. William Ogden, E. St. Louis, III., won Open C/L scale with F.W.190 (380 pts). PAA Clipper Cargo 020 winner Bill Langley his entry lifted 39¼ oz. 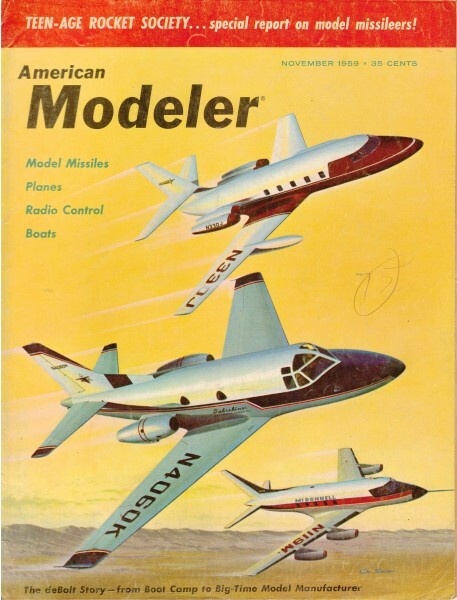 The Champions' all-expenses paid trips to and from California came as a result of a program activated in March '59 by the Model Aeronautics Division of the Hobby Industry Association of America. 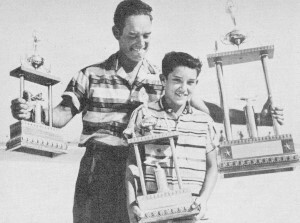 The 1959 Championships was a huge success. 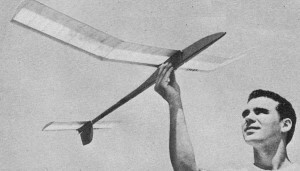 From the first hand launched glider flight indoors to the last dethermalized outdoor flight, the last transmitter turned off, the last lines to be rolled up - this was a contest long to be remembered. We had always wanted to watch one of these instead of competing so that we could see and possibly feel what happens at a Nats. What we saw was a lot of work by some very unselfish AMA members, some real fine flying by other members, and a friendly competitive feeling that we had just sensed before. There was definitely over a thousand model builders who came to Los Alamitos to win if they could, but most of all they had fun. All across the field at every event you could head what has now become a classic, "Smile - it's only a hobby." The behind-the-scenes activities which made this contest go were well managed by Keith Storey. He had lots of help from hardworking Pete Sotich, Earl Witt, Johnny Clemens, Maurice Teter, Frank Ehling, and Herb Honnecker ­ just a name a few. Not forgetting the various events directors who gave up their chances to fly so that this contest could really go. For the Navy under Capt. C. L. Westhofen, this was their finest effort. Cmdr. Howard Sturm kept all your local newspapers advised and when you won some place, he even mailed out pictures to those papers. Among the guys who flew R/C, Commander Pappy Wise, who directed the Navy personnel, will always be remembered. After the contest was over on Sunday afternoon "Pappy," who had been saying all week that there was nothing to it, was handed Howard Bon­ner's transmitter. He was told which controls did what, the Torp 45 was touched off, and the Astro Hog released. Pappy's take-off and climb for altitude was real sweet. We had the judges start judging - then the fun began. For his first attempt Wise did a fine job, he got a little crossed up when the bird was coming towards him, but he got out of a situation that many experienced fliers would have clobbered. The landing was a little rough - Pappy's score was 41 points, but he got it off-flew the pattern - looped-rolled. He didn't have to eat his words. Of all the Navy personnel who worked this contest special honors go to TD/2 Bennie Castillo who directed the flight line at RIC and practically ran the event. He kept the guys moving up, the ready pits full, shuttled the models to their proper judges, cross-checked frequencies for proper operation and kept everyone posted of any interference. It's hard to say which radio models were most outstanding in the way of design and development. Certainly one which doesn't take a back seat was Howard Bonner's "Suds" of delta configuration. 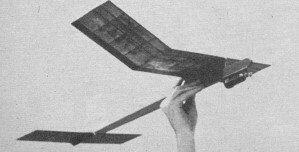 The fuselage was vacuum formed from butyrate sheet plastic and filled with "Lockfoam" for rigidity, the foam was then cut out for the controls. The engine, a Torp 19, was mounted in the vertical fin and the shaft was ported for left hand operation. In flight the model was beautiful, but Howard thought it a little too heavy for tight pylon turns, so its average speed suffered. The control linkage was mounted so that a parallelogram principle could be used for elevators and ailerons or elevons, if you prefer. Fred Dunn's Astro-Bipe was another newcomer which shows great promise. Although too new to be what Fred wants in the way of a model, both Dunham and Bonner who have flown it says it's a sweet baby. Certainly the inverted spins, reverse spins and other stunts that Fred put the bird thru spoke for themselves. Milt Boone of the Larks designed the "Charger" which swept rudder only, placing 1st, 2nd and 3rd. This little bird is only 48. inches in span, has a tryke gear and an as 15 R/C. The Orbit single runs a Varicomp for rudder and a modified Varicomp for 3 speed engine. The transmitter was modified with a relay to discharge a capacitor for quick blip engine control that was positive. Ken Oliver and Louis Scheel had a 2/3 Astro Hog powered by an OS 15. This tiny one had 8 channels of R/C gear miniaturized so that all up weight was only 41 ounces. This Tremac control system used parts of the "Mighty Midget" for servos, cut down of course, a home made reed bank-no relays but a circuit of 18 transistors for switching. The servos measured only 1 x 1 x 1-3/16 - mighty small. There were lots of other goodies, too. Bonner's retractable landing gear, Chuck Boyer's flaps, Dale Root's dive brakes and wheel brakes, Doug Spreng's steerable nose wheel with brakes, a Jerry Nelson design pylon racer model flown to 1st by Bill Deans, Dunham's Delta for pylon racing. Things are changing rapidly in R/C! In outdoor free flight the birds were much larger due mainly to the new rules. Contrary to some thinking the big models, even tho underpowered by comparison to last year's jobs, are putting in longer flights. 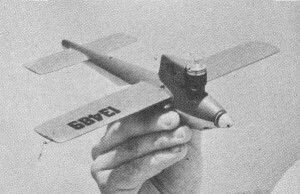 From Bud Romak's 10- foot 8-inch Mac 60 powered model to the 450-square-inch Hornet powered ½ A's, more balsa is being sold than ever before. The models being bigger are more stable, they glide better, their thermal riding ability is better and their flights longer since they stay in sight longer. We observed two ½ A's which had enough momentum to go thru wind­shields, the new more powerful engines take the ½ A's up almost as high. The Big B-C models don't climb as high but glide more than makes up for this. The main requirement seemed to be a larger box or car to carry the models in. The highest total times in the contest were in Class A where Allen Ross of Phoenix posted 27:58 in junior and John Pond of San Francisco did 27:28 in open. During the "A" event we counted 23 models in the same thermal - this was good flying weather! The Nordic events seemed to be ones where every contestant made at least one goof flight. To place very high at all you had to have 4 max's. Only one man, Warren Kurth of Bloomington, managed the coveted 5 max's - he did this in A/1 open. Jose Ramiriz of Mexico City lacked only 7 seconds on one flight or he would have had 5 max's. Jose is the Mexican champ in A/2 and although he was flying an original model with a so-called "thick" wing section, which is so necessary at their mile-high altitude, he continued his winning ways and posted the highest A/2 time with 14:53. The rubber events produced nothing real startling unless one counts the indoor type model flown by Curt Stevens or the elliptical dihedral models of John Gard. John was a shoo-in for the Wakefield events until Hank Cole showed up late, flew 5 max's and a fine 2 :41.6 for a new record. 44 of 50 Air Youth State Champions who flew (U.S. Navy photo). In unlimited rubber Lo Salisbury had the highest rubber time of the contest, 21 :11. Ralph Knapp didn't wind his motor on his 4th flight and was disqualified-say, when was that rule slipped us? We didn't have it previously and besides the indoor fliers don't always follow it. Class C speed job by Jim Nightingale-154.18 with McCoy 60; Fiberglas body; 22" span. Jim Cowart who took Sr. combat, original 36" span Fox 35 model. Warren Kurth's 049 Thermal Hopper "Peanut" topped 1/A speed at 91.35. Kurth of Bloomington, III., won Open Nordic All with that towline glider setting national record of 16:23; original spans 47". 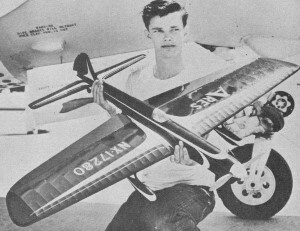 Bill Werwage shown with Sr. class "Ares," aerobatic model brought him National Stunt championship; spans 52"; Fox 35. Riley Wooten with his Open combat winner. In the other outdoor events Walt Mooney and his ancient scale Bleriot (we think his model was an original built by Bleriot) made some real fine flights to barely nose out Danny Lutz. This free flight scale soon became heartbreak alley because of the disastrous crackups to those beautiful models but unfortunately they must put in flights and some just didn't. ROW times this year were a little disappointing , perhaps the floats added to the required heavy power loadings were just a little too much for the large models but the ½ A's shouldn't have suffered. The lift in this area was noticeably lacking so that the high time didn't approach previous marks. 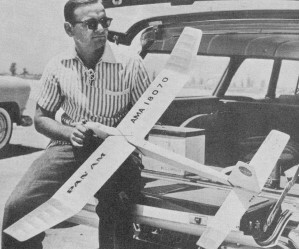 Chuck Primb's twin boom-low tail model was most unusual and had been entered in multi­events. Sal Taibi converted his International PAA Load to ROW but couldn't do better than his first flight of 4 :40 plus. U-control speed fliers were met head on with a fuel mixing problem. Engine after engine was brought in for one or two laps, then refused to burn the fuel for the rest of the runs. Bill Wisniewski had out his home-made 15 for this competition and topped all other speeds by 15 mph for 134.07. Bill has built 6 of these fine engines and if and when we send a team to Europe, he is planning on outfitting each team member with two engines apiece. There was practically every commercial make of 15 entered. The Fox engines swept to 1st and 2nd in Class B, Ed Rankin barely nosing out Jim Paysen. John Bowman of New Orleans had a creditable 128.06 in senior. In class C a whirlwind finish was put in by Jim Nightengale to top this event. Jim rushed off to the hangar just 20 minutes before quitting time, mixed up a special brew and at 4:53 torched off his Mac 60 for a winning 154 plus mph. Jim said that it took him until then to figure out what the fuel needed. Leroy Polk, Jr. of Atlanta set a new record for C junior with 151.71 and Fred Carter III of Wichita Falls won senior with 150.82. Larry Grogan of Dallas, a senior, topped all fliers in Proto with a zipping 122.07, just a fraction behind his own record. This Proto event saw a lot of flights disqualified because of "whipping." Official Ralph Flaatan was eye­balling the fliers thru a pair of binoculars from outside the circle and if one wants to have a line's eye-view of the handle - try this. Incidentally, at least two of the fliers in contention for Nats ­ champion found out the hard way that they must not lead their models. Incomparable Riley Wooten of Lubbock powered his way thru all combateers to post another win in open. Using pressure tanks, hopped up Johnson's and featuring all-moveable tails, his birds were hot and real neat. In "Team Race" Gene Leedy continued his winning ways with his high aspect racer, closely followed by a neighbor, junior flyer Ronnie Young. Both use special McCoy 29 rear rotor engines and were getting 55 to 59 laps per ounce. They cut their engines after 50 laps, gliding in to their pit crews - the only way to fly. 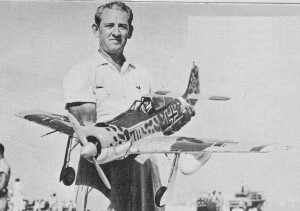 Bill Werwage who is only 17 topped all stunt fliers regardless of age to win the Jim Walker trophy. 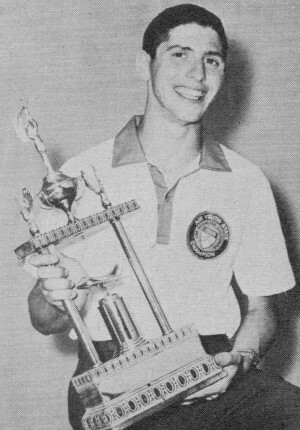 Bob Palmer had won open and John Gudvangen, Jr., the junior crown. Pan Am's payload events this year had by far the largest number of entries ever. In Clipper Cargo alone 58 modelers participated. George Gardner attributes this to Dallas. Sherman's logic and hard work. "Looks like Dallas has hit the jackpot," said George. The 020 engines and the total weight rules have converted the cargo models from huge fragile monsters of like design to a variety of originals; in fact, there was much more originality in PAA events than in any other. Larry Conover's twin boom semi-scale of Pan Am's early Boeing clipper. 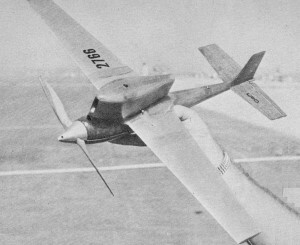 Walt Mooney's twin boom low wing design. We saw sleek streamlined trike gear models and pushers. Some modelers applied colored dope liberally in trimming - it all counts now. 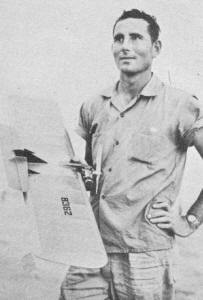 Larry Conover arrived using a black 3 bladed plastic prop, 3½ D x 2½ P. His engine really put out. Walt Mooney took one look, listened, and then went buying. Other modelers soon followed suit and the contestants supply store sold out. Roy Cox they sent over to the factory and replenished the supply. These props made a big difference. The outstanding flyer in jet, in our opinion, was Danny O'Malley, son of old-timer Owen O'Malley. Danny won rocket, then posted 14:50 plus for 3 flights in PAA jet, a truly remarkable achievement. What Owen does in packing these jet motors is unknown. We do know that the youngsters who hopped on him to pack for them topped all the other fliers. Good show, OO'M. The indoor session was held at the Santa Ana balloon docks which surprised most entrants since this facility had turned down an earlier request for its use. As a consequence, a lot of the modelers suffered having made special low ceiling designs, then had to be content to not use up the added height. For this reason we believe the times were held down. Lewis Gitlow of Ontario, Calif. and Charles Sotich of Chicago divided wins and 2nd places between them in "mike" stick and cabin. Lew winning stick and Charles cabin. Each won the other 2nd place. Jack Block had high glider time with 1:09.2 followed closely by Curt Stevens with 1:07. The Thermal Thumbers led by Lo Salisbury's 16:05 really cleaned up in paper stick. Sherwin Maslowe of Detroit amassed a great number of his championship points in these events when he won Sr. paper stick with 13 :42 and senior "mike" stick with 18:25-real good flying. In the junior events Brent Hawkins of Morton, 111., really cleaned up by winning 3 firsts and a 3rd. He won paper stick, "mike" stick and cabin and was 3rd in glider - how about that? 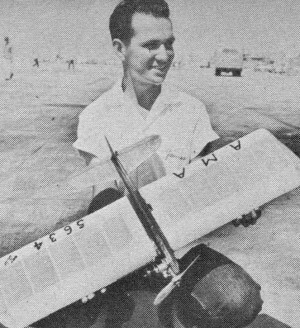 John Lenderman master-minded a six­inch glider contest which was held between the hangars one evening. They had 38 junior entries, 19 seniors and 10 in open. These guys had a ball - regular contest rules were followed except for the limit of 6" span. High time of 40 seconds was posted by senior .G. Westland with 40 seconds. Open entrant Lee Hines had 39.2 and junior entrant J. Krannock 25.2 seconds. We could go on and on about this contest. One thing for sure it was the biggest ever held in California. HIA's Air Youth Champions were indeed an added asset with the fine showing they made both on and off the field.